STG offers a wide range of Peripherals and Accessories designed to augment Access Control Installations. A unique double pole manual call point, with high visibility LED, and which includes both frangible and resettable windows. It also offers user-friendly selection of the usual monitoring resistors. To purchase this Emergency Door Release online please click here and you will be redirected to our affiliate company e-commerce site. 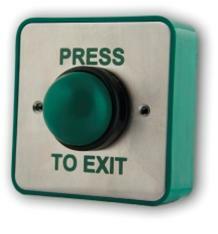 A heavy duty Request-to-Exit push button with a green domed button. 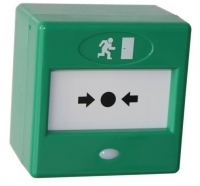 Designed for continual use, high visibility, ease of use and supplied with a green surface mount. To purchase this Heavy Duty Request-to-Exit Push Button online please click here and you will be redirected to our affiliate company e-commerce site. A range of Request-To-Exit devices designed to replace mechanical push buttons with proximity sensing to increase reliability and descrease access control system downtime. To purchase DRPR001 Stainless Steel Proximity Request-to-Exit Push Button online please click here and you will be redirected to our affiliate company e-commerce site. To purchase DRPR002 Single Gang Proximity Request-to-Exit Push Button online please click here and you will be redirected to our affiliate company e-commerce site. To purchase DRPR003 Mullion Proximity Request-to-Exit Push Button online please click here and you will be redirected to our affiliate company e-commerce site.